In this article, Dr. Reginal Harris from San Antonio, TX, a MoneyWi$e instructor and stipend recipient, shares some lessons learned as well as success stories from his seminars and workshops aimed at empowering youth and adults. Since November 2007, Empowerment Seminars, Inc. and InfoSource Communications, LLC have pooled our resources and expertise to provide financial literacy training and professional development workshops to youth and adults throughout the city of San Antonio and Bexar County. Empowerment Seminars, Inc. agreed to allow me to offer financial literacy through its Youth Empowerment Academy. With the addition of our training and partnership with Consumer Action, we have been able to reach twice as many people than we’d anticipated. We are grateful for being selected as a recipient of your stipend program this Spring. It is so great to have these materials to provide to our participants. I like that the materials are also available in Spanish for our non-English speaking participants. We feel we should be able to provide financial literacy to everyone, regardless of ethnic backgrounds and cultural differences. 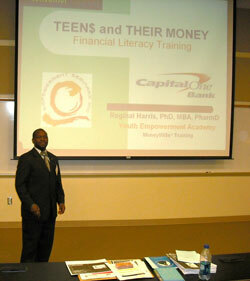 Since 2007, we have provided a variation of “Talking to Teens about Money” and “Banking Basics” to nearly 1000 youths. Before incorporating the materials from Consumer Action, our outreach was limited. By incorporating these materials, we have been able to enhance the hands-on aspects of the workshops for the youth. We find that the more interactive the program, the more participation we get from the students. Our surveys for these two programs have revealed that young people want more interactive programs so we are looking at ways to make the MoneyWi$e and Youth Empowerment Academy materials more interactive. One of the useful aspects of integrating the MoneyWi$e material with our program is that we are able to augment the basics of business management skills and money management to adults who either have been in business or are planning to go into business. This is where using the “Micro Business Basics” and “Managing Your Money Wisely” modules has helped the most. As an Adjunct Instructor of Pharmacy Management, I have also been able to ‘marry’ the MoneyWi$e materials into my lectures to facilitate well-rounded discussions on improving business outcomes. As an organization, we have been able to provide actual handouts and brochures to individuals and businesses who are seeking to find funds for their business, looking into SBA loans, understanding profit-loss statements, and correcting small business mistakes. The overwhelming thank you emails and notes we receive are just a minute indication that what we are doing is worthwhile. On a personal note, I have been able to share with my entire family the brochure on “Building and Keeping Good Credit.” In addition, I was able to incorporate this topic into a presentation I did for over 300 college students in January. The results were overwhelming. It is amazing how much people really don’t know about the changes in the laws affecting their ability to protect their credit. Discussions are underway with three local high schools and five local colleges in San Antonio to allow us to speak respectively to their graduating seniors and incoming college freshman on the changes in the credit card laws being considered in Washington, DC. It is because of our activism with Consumer Action that we are aware of these changes before the general public and we want to be able to share them with as many graduating seniors and first time in college freshman as possible. We feel strongly that if we can empower young people to understand the value of money and credit, we will help them make better decisions as adults. The case studies, activities, and exercises are the highlights of the programs we’ve conducted. Each of the modules discussed above have built-in benefits for participants and provide a great opportunity for us to grow and look for other creative ways to deliver our programs in a more interactive fashion. Without a doubt, the activities and interactive exercises are the highlight of the training, because they afford the participants the opportunity to balance listening with doing. This gives us a barometer of how well our delivery of the didactic information is being received and applied. 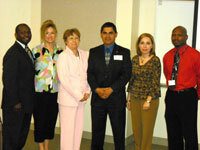 The most spirited discussions to date have been about credit and micro business seminars. In most cases, we are dealing with adults who either have more questions than we can answer in the time allotted or who get into rational debates with their fellow participants on application of the materials to their respective business. It’s a lot of fun to see the participants come alive in the seminars. Being able to motivate people to do anything is challenge, especially asking them to sit and listen to a presentation. We’ve decided to make sure we make the entire program as interactive as possible. In other words, it becomes more a mini-workshop with several teachers versus one instructor with a room full of students. We’ve made a concerted effort to partner with our local school districts, municipalities, church/civic organizations, and colleges/universities, because they give us a directed audience pool. The average time of our presentation is usually about 45-70 minutes, depending on the audience and subject matter. What captures the attention of our participants is that we are personable and open about our own challenges and struggles with money and in life. The old adage, “People don’t care how much you know until they know how much you care” is the foundation by which we go into each program. It has proven successful to open each program with a story about my life that relates to the subject matter. This captures the attention of the audience and wins them over to really listening to what is being said. They see the presenter as someone who has overcome adversity rather an unengaged, boring speaker. In my opinion, the highlight of the program is reviewing the surveys turned in by the participants to see what comments they’ve shared. We’ve maintained about a 9.25 out of 10 rating for the overall grading of our programs. Since November 2007, we’ve reached over 1000 students [high school and college] and over 300 adults. Our partnerships continue to grow. Currently we have partnered with the largest school district in Bexar County, the Judson Independent School District that has over 10,000 students. We have reached out to over 20 local church groups, 10 civic organizations, and 12 municipalities to offer financial literacy and personal development programs. We pride ourselves on making our seminars and workshops practical by incorporating all the MoneyWi$e materials with our own expertise. Many of our participants have lauded us for making the workshops easy to apply to their daily lives, which is the foundation of Empowerment Seminars, Inc. We’ve developed a monthly newsletter that will feature a monthly topic on financial literacy. It will be posted on our website and emailed to those who subscribe to receive it. We look forward to making financial literacy and personal growth and development a way of life for all. Let us share a few of our success stories. We’ve heard from new small business owners who’ve used Consumer Action’s Micro Business information to improve their business. One young man started his own home improvement business after understanding how to write a business plan and apply for a business loan. One gentleman who received copies of the brochures last year wrote to inform me that, after learning how to save and clear up his credit, he has written his first book and is self-publishing it this Spring. Many young people [high and college students] have stated that they had not known how to write a check or even how to budget their money before our seminars and workshops. Countless parents have thanked us for providing their children with a better understanding of what they go through to set-up a spending plan. 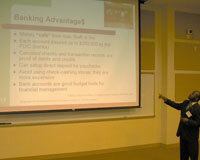 It was shocking to learn how many high school students with jobs did not have direct deposit or a saving account. Now, we are hopeful that the trend will change towards enlightenment and self-improvement where it concerns money management. We are hopeful that as we journey across our city and county that we will continue to provide money management tips that will make the youth and young at heart look at and think about their finances more wisely.